HOW TOYOTA VVTi ENGINE WORKS? VVT-i, or Variable Valve Timing with intelligence, is an automobile variable valve timing technology developed by Toyota, similar to the i-VTEC technology by Honda. The Toyota VVT-i system replaces the Toyota VVT offered starting in 1991 on the 4A-GE 20-Valve engine. Perodua use this technology and convert the name to DVVT(Dynamic Variable Valve Timing). The VVT system is a 2-stage hydraulically controlled cam phasing system. VVT-i, introduced in 1996, varies the timing of the intake valves by adjusting the relationship between the camshaft drive (belt, scissor-gear or chain) and intake camshaft. Engine oil pressure is applied to an actuator to adjust the camshaft position. Engine designers have known for a long time that they could get better performance out of an engine under certain circumstances by allowing the intake valve to open slightly before the exhaust valve closes. This increases the time for the fuel/air mixture to enter the cylinder during the intake stroke. In this condition the exhaust and intake valves are open at the same time; this is called ‘valve overlap’. In conventional engines ‘valve overlap’ timing is fixed. 1) Fuel is wasted – the fuel/air mixture is not always efficiently burned and this causes unburnt fuel to pass through the engine. 2) Higher levels of undesirable exhaust emissions are produced. 3) Power output potential is not fully realised. Variable valve timing allows the relationship between the separate inlet and exhaust camshafts to vary the valve timing overlap. In doing so it overcomes the side effects described above by using a computer to continuously vary the intake valve timing and overlap. The valve timing and overlap are adjusted through a series of simple mechanisms to ensure the optimum conditions apply across all the working rev range. The advantages are lower fuel consumption, lower exhaust emissions and higher power output. Because the system is continuously variable, an ‘i’ for ‘intelligent’ has been added to the acronym. In 1998, “Dual” VVT-i (adjusts both intake and exhaust camshafts) was first introduced in the RS200 Altezza’s 3S-GE engine. Dual VVT-i is also found in Toyota’s new generation V6 engine, the 3.5L 2GR-FE V6. This engine can be found in the Avalon, RAV4, and Camry in the US, the Aurion in Australia, and various models in Japan, including the Estima. Dual VVT-i is also used in the Toyota Corolla (1.6 dual VVT-i 124bhp). Other Dual VVT-i engines include the 1.8L 2ZR-FE I4, used in Toyota’s next generation of compact vehicles such as the Scion XD. It is also used in the 2JZ-GE and 2JZ-GTE engines used in the Lexus IS300 and in the Toyota Supra. 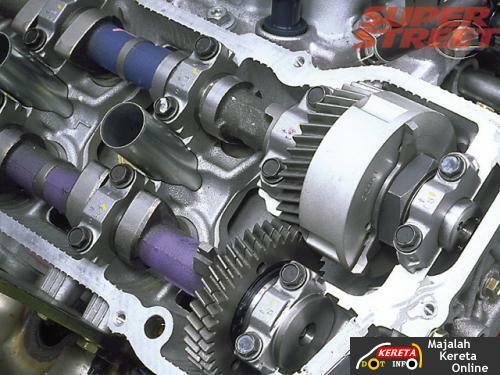 By adjusting the valve timing engine start and stop occurs virtually unnoticeably at minimum compression. In addition fast heating of the catalytic converter to its light-off temperature is possible thereby reducing hydrocarbon emissions considerably. may some one gimme the way how n where i can get the guider……. where are the exactly right place or person i can refer to……please. On a newly rebuilt 1.8L 1zz-fe, what would not allow oil to flow to the VVTi controller when the OCV and it’s screen has been replaced? and I have you saved as a favorite to look at new stuff in your website. Nice interpratetion of the product on the ground! Plz alert me always on new engine technology. I own a 2007 Toyota Camry LE. Ever since I purchased it, I have only gotten 20 mpg in the city, sometimes it goes down to 18. On the highway I can go up to 23-24 mpg. My Camry is an automatic. With this special engine, and I’ve always maintained it, none of this is making any sense. I live in Colorado Springs. Is it the altitude? Am I driving it wrong? Nobody seems to be able to give me any answers other than to say that the mileage isn’t guaranteed. I’m very careful about the “leadfoot” as I used to work in insurance, so I do understand a little bit. Does anyone have any suggestions or ideas? i have a car on F premio 1nz vvti engine.cold condition is not srart. try 1,2,3 or selvstater then start.but hot condition is no problem, just one try and start.what’s the problem. I own a Toyota Premio VVTi engine no. 1ZZ-FE, 2002 model . Recently car heated up and when we stopped for 6hrs coolant was there but it refused to start. Mechanic came found oil and water was mixed up he replaced the Gasket and resurfaced the Cyclinder head. But the still has failed to start. I have toyota quantum vvti make I am looking for computer box . I am an Automobile Technician in Ghana and am new here on this plateform. I loved n like the things were explained with foto graph and would want to be receiving update on Toyota technologies. The lesson I learned Dis morning really opened my mind and would want to continue with sharing ideas on Toyota engines works. your presentation but I to find this matter to be actually something which I think I might never understand. I am having a look forward for your next post, I’ll attempt to get the dangle of it! I once agawin find myself spending a significant amouint of time both reading and posting comments. But so what, it was stiol worthwhile! goes to prove the rapid growth and evolution of social media as a business tool. printer you are using to deterimine the resolution.